Aralon, Clash Of Puppets, And Slingshot Racing Join Humble Crescent Moon Mobile Bundle—And We Have 10 Codes To Give Away! The Crescent Moon Mobile Bundle was already an impressive collection of DRM-free Android gaming goodness when it hit the web a week ago, and now it's even better. The ten included games (four of which making their Android debuts) have been joined by three more—Aralon: Sword and Shadow, Clash of Puppets, and Slingshot Racing. Like most late Humble Bundle additions, these three titles have made the rounds a few times. Aralon: Sword and Shadow is an epic RPG that brings Elder Scrolls-inspired gameplay to mobile devices. Clash of Puppets, despite having nothing to do with clans, is a 3D hack'n'slash experience. Slingshot Racing is a top-down racer with rather pretty visuals. Are they worth getting the bundle for? The better question is, do they make an awesome deal any less awesome? Seriously, if you haven't already, go back and watch the trailer for Exiles: Far Colony. That game looks easily worth the $8 you have to pay to get it, and if you make the effort, these three extra games join the other nine that come included. But don't go anywhere just yet. You might not actually need to buy this bundle to get the goods. We're giving away ten free codes. Here's what you need to know. 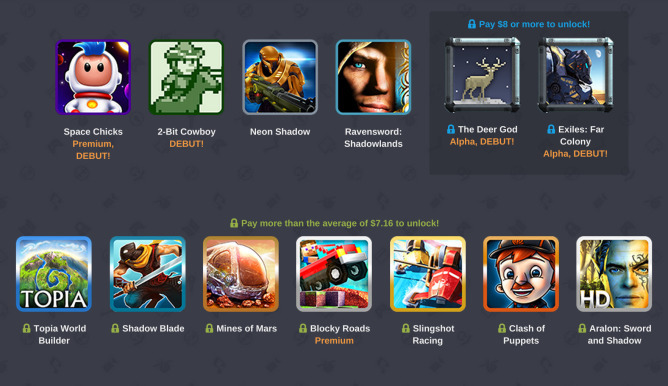 We've got 10 codes that grant access to the full bundle of thirteen games. If you want to enter the drawing for a code, just leave a comment below. We'll choose 10 random winners tomorrow (December 2nd). Good luck!